Did you see the Office Max Deal of the Day today? If you are still looking for laptop deals, there is a great deal today. Get the HP 2000-353NR Notebook PC for only $339.99. Shipping is free with this purchase! This offer is good now through 10pm Pacific. 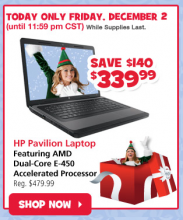 Offers Dec 2, 2011 in holiday, home, laptop, OfficeMax · Expired!